"When working on the program Shifting Images the urge arose to dedicate a work to more explicit human questions, a work that would have a relevance outside the usual concert situation. As I wanted to express ideas about changing ethical positions in times of conflict, I chose not to use contemporary music, but distorted folk music, and not to use just my own pictures (only the pictures made in a Palestine refugee camp and in Syria are mine), but mostly existing journalistic material. 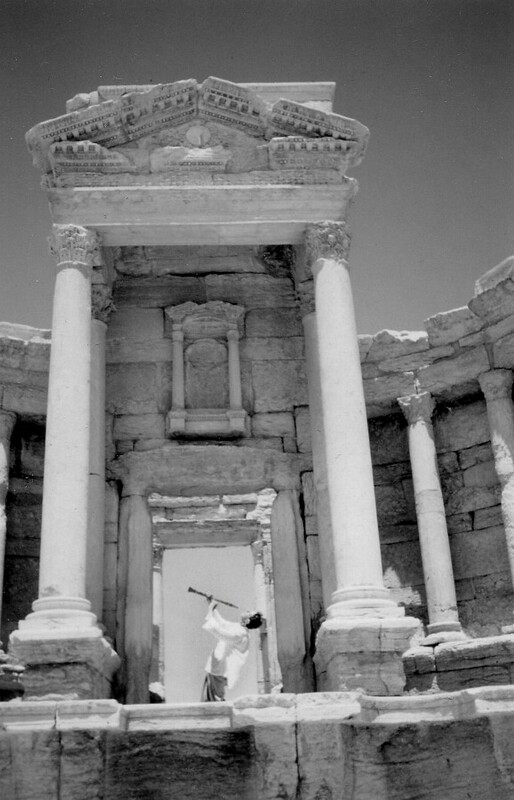 Starting point in my approach, and a reason to choose the Middle-East as an example, is a picture of a mass execution by Isis in 2015 that took place on the exact spot where I played clarinet, and was photographed, some years earlier in the Palmyra amphitheatre - see below. The result is a twenty minute performance for clarinet and video that can be performed as part of Shifting Images, but preferably at more open and dedicated occasions".